Cherished by locals, the Village bursts with creativity, exquisite food and just enough quirkiness to keep it interesting. Though it's only a fifteen minute drive - or a short Light Rail ride - from downtown, Mt. Washington Village feels as though it's a world away. Visit historic Mt. 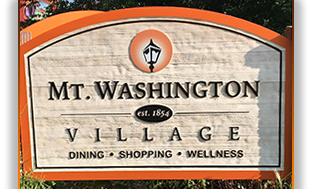 Washington Village, an extraordinary destination where fond memories are made. Nestled in the northwestern nook of Baltimore City, its colorful, historic charm exudes the warm qualities of the old world summer getaway for which it is famed. Nostalgic, yet distinct, familiar and luxurious, the Village's boutiques, salons, galleries, restaurants and cafes are set amid a stunning landscape of gently wooded hills, old trees and a glistening stream. There's no other neighborhood like it. Experience Baltimore's legendary retreat. Where city-dwellers once escaped the hustle and bustle, there now resides a quaint neighborhood, with dining, shopping, and arts, in the most serene setting to be found in the area.